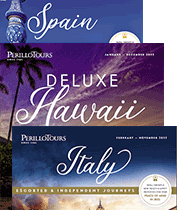 Perillo Tours has been America’s leader in travel to Italy since 1945. The following escorted tours have been in continuous operation for 40 years and enjoyed by 750,000 guests. Each itinerary . . . activity . . . hotel . . . and meal . . . has been personally selected and perfected by Steve Perillo, according to the highest standards of founder Joseph Perillo and Mr. Italy himself – Mario Perillo. Chances are, YOU know someone who’s enjoyed one of our famous Italy tours! Perillo's Italy North Classic is the largest selling Italy tour in history. Developed in 1975 by Mario Perillo and Lucio Massari, it remains our most popular itinerary today. The 'Continental' tour delivers the identical itinerary (in reverse) but without dinners. Our Marco Polo Tour is the counterpart to our Vesuvius Tour. One featuring Venice, the other featuring Sorrento. Either way, you can be assured that Steve Perillo has hand-selected every hotel, restaurant, sightseeing experience and guide that will make your vacation the memory of a lifetime. Lemon trees and vineyards cascade down the terraced cliffs to the sea. Soft sea breezes mix with the scent of fresh basil, tomatoes and olive oil. Capri sparkles in the distance. Welcome to Amalfi! This is a no-holds-barred invitation to live life to the fullest. Our new tour – a culinary, cultural delight! Enjoy wine tastings, cooking classes & a trip to Fico in Bologna – the largest agri-food park in the world! If you're looking for a compact and affordable Italy Vacation - Our Vesuvius Tour is perfect! The itinerary is meticulously crafted by Steve Perillo and his team to run like a 'Swiss Watch' and be lots of fun too! On this Perillo tour, you’ll experience firsthand the wonders of Northern Italy. This treasure packed tours takes you throughout the celebrated northern gems including Bologna, Rapallo, Stresa, Parma, Venice, Cinque Terre, La Spezia, Portofino, Lugano, Lake Como. We just wanted to tell you what a wonderful time we had. The accommodations, food and tours were all terrific. There was a nice balance of group time and alone time. It was great not having to deal with luggage too. We would definitely recommend Perillo to anyone considering a trip to Italy. Mirna was a superb tour leader – the best I’ve had on multiple trips and tours worldwide!. Not only was she super organized and knowledgeable, she was extremely patient! Mirna handled all the guests professionally, tactfully and effectively. I would recommend Perillo Tours to anyone!